We have 2 despatch seasons – Spring and Autumn. 1. 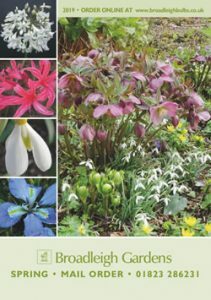 Spring Catalogue (January) covers items posted in Feb – April (snowdrops,agapanthus, lilies, hellebores and herbaceous perennials) Order these items now from our online store. Special items will continue to be offered from here in Somerset. Tulip sprengeri, species daffodils etc. These will go online only as a special list in August.